This weekend we had fajitas again (beef this time, just follow same recipe here maybe adding a little more cayenne) a couple of bottles of wine and watched Django Unchained. First, the movie ROCKS. It does a fantastic job of ridiculing and reviling the slaver culture of the American South. 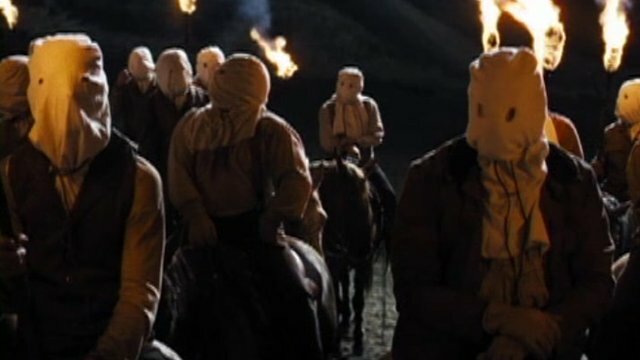 It’s surprisingly funny (oh the scene with the wannabee Klan and their hoods is worthy of Blazing Saddles or Monty Python. Be aware that the video is full of hateful and ignorant language) and not as bloody as some Tarantino movies. It’s still plenty bloody though. One forgets just how good an actor Samuel L. Jackson is and then you see his character Stephen, versus, say, Nick Fury. I do love a good violent revenge movie, enjoying High Plains Drifter immensely. Another great movie with a surprising Mr. Jackson is Unbreakable. I’ve heard that some think this movie is racist. I don’t see that, other than the idiot racists being displayed. It shows that people, no matter what shade of skin, can be good guys and bad guys. The wine was a foray into “what’s cheap at the store”. First, is Hey Mambo Swanky White. I bought it because of the bit of purple prose on the back lable. Husband and I enjoy blends and this is very good, though don’t drink it after eating sweet corn. It just doesn’t taste good. The flavor has a nice strong musky muscat flavor. Second, Flipflop Left Coast Pinot Noir. It was a very nice pinot noir, not too tannic. I’d buy it again. Both were around $7 on sale. Definitely a lucky set of choices this week.